In the first of a series of occasional features on the many activities Fordell has to offer, one of the most popular...the climbing tower. 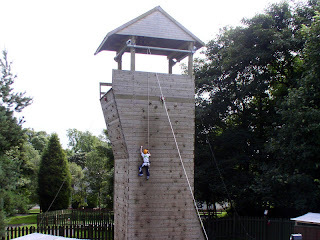 Fordell has offered climbing as an activity for over 10 years - the original climbing tower was situated in the main field and saw many years of use by visitors, but several years ago the much-improved climbing tower was constructed between the wet weather hall and SHQ building. The tower stands approximately 40 foot high in total, with the actual routes being just below 30 foot in length. 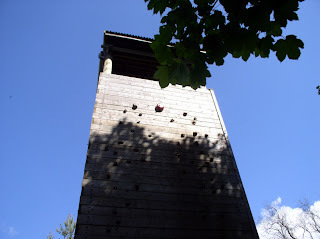 3 walls of the tower are used for climbing with the other being used for access (there are stairs inside to allow instructors to setup ropes before the session). There are 6 routes at present, ranging from the fairly easy to fairly hard (overhanging). Since most users will probably not be regular climbers (and most climb in trainers or boots), the routes are designed to be challenging but not so difficult that everyone can't manage at least some of them. Above : doing things the hard way - doesn't the young lad realise there is a nice easy staircase on the other side which goes right to the top? Climbing sessions generally last 2 hours with a maximum group size of 12 - the first part of the session consisting of safety/technique briefing and issuing of harnesses/helmets before actually climbing. Participants climb one at a time and are belayed by a staff member using a top-rope which ensures maximum safety for those taking part. All staff are trained and assessed by our external climbing instructor and are encouraged to take part in regular in-house training sessions. A novel feature of the tower (apart from the double glazing) is that at the top of each route there is a good old-fashioned fire-bell. The purpose of this is to provide a means for each climber to prove to everyone that they got to the top by ringing it, something which is fairly straighforward on the 2 vertical walls but which requires unusual effort or extreme flexibility on the overhang (or freakishly long arms). The climbing tower is also very popular with day visitors (particularly birthday party groups), and the centre is happy to provide shorter 1-hour sessions which give visitors a quick taster session of climbing and leave plenty time for other activities too. Next time...the children's favourite and the parents' least (due to the mess)...the Challenge Course.